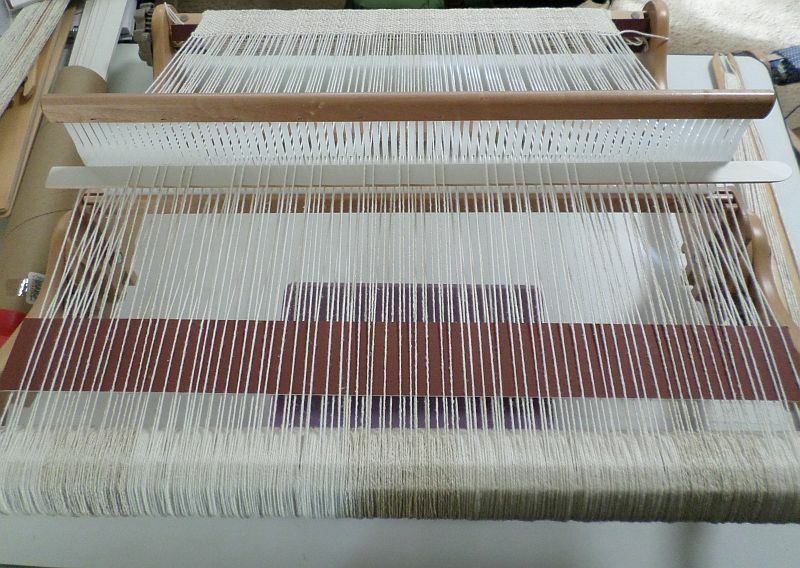 I’m using the Ashford 20″ Knitters Loom and a 7.5-dent heddle*. It has 75 reeds, 74 of which are usable—thus, 148 warps. The mathematically less-challenged can probably use those numbers to divide up the warps, but I just use two pick-up sticks and make sure they meet in the middle doing the same thing on either side of the center. (Works for me.) In this case I got lucky, came out right the first time, no planning required. With the heddle in the down shed (hole warps down, slot warps up—heddle is also in down shed position for picking up weft floats), insert a strip of matboard behind the heddle, between the sheds. If I remember correctly (because I did read the introductory instructions last year), the matboard isn’t required but is a convenience that helps you clearly see the warps (more necessary if your warp is not a smooth, solid-colored yarn) and keeps your pick-up stick away from the up shed (hole) warps. I don’t think it’s necessary to leave the matboard strip in place. Because I’m weaving a warp float pattern (performed when the heddle is in the up shed; weft floats are created in the down shed), I’m using my thinnest pick-up stick. 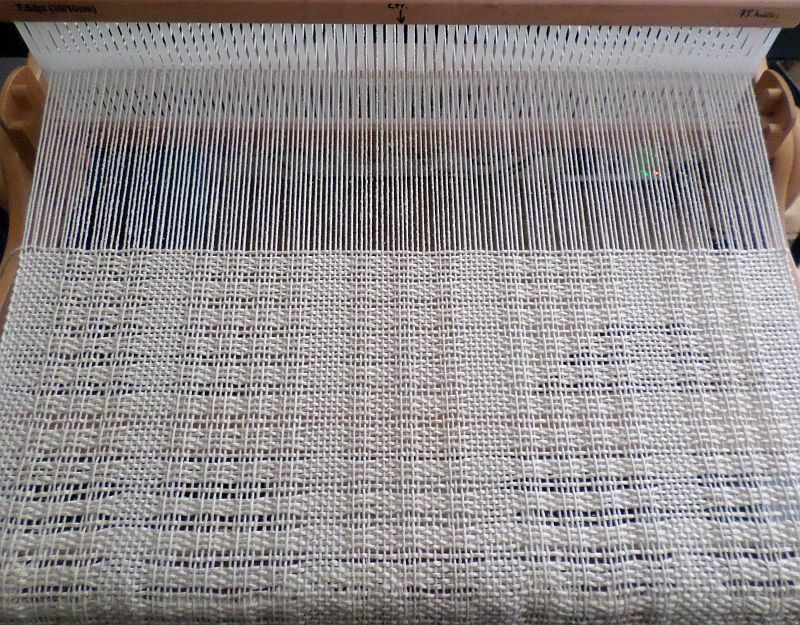 I experimented with my thicker pick-up stick (more suitable for weft floats) and found that the thin one keeps the warps in front of the heddle more level with each other. Thus, I can weave a lot longer before advancing the warp—the shuttle points are less likely to catch on the warp threads. My pick-up stick is no thicker than my warping sticks. It’s a piece of a wooden window blind, cut to length, sanded, with one end tapered for picking up individual warps. Photo taken from the back of the loom. Shows close-up of matboard strip and, more significantly, the position of the pick-up stick right up against the back of the heddle in the up shed—the correct place for warp floats. Use your thinnest pick-up stick for warp floats. Because it’s a mirror image pattern, you can enter from either left or right. Ms. Davenport uses the terminology Up, Down instead of Over and Under—referring to pushing the warps up or down. Because I’m used to pin loom weaving and the action of the needle—either over or under the warps—I found Up and Down confusing since the pick-up stick, in my opinion, was weaving just like a needle. Up refers to Under (handy, that) and Down refers to Over. The piece is still being woven on the loom. I wanted to write all this info down while it’s still fresh (and interesting to me).